Do you seek prompt relief for headaches or back pain by popping a pill? Did you know that taking strong medicines and steroids to relieve painful symptoms weakens the body’s natural immune system? We bring to you an alternative system of medicine i.e., homoeopathy, which body to heal itself. Homoeopathic medicines do not suppress the symptoms but boost the body’s vital force. Homoeopathy is rapidly growing system in the world. It has become a household name due to the safety of its pills and the gentleness and thoroughness of its cure. This book introduces you to the various principles and philosophy of homoeopathy. It gives a detailed description of the working of homoeopathic medicines. 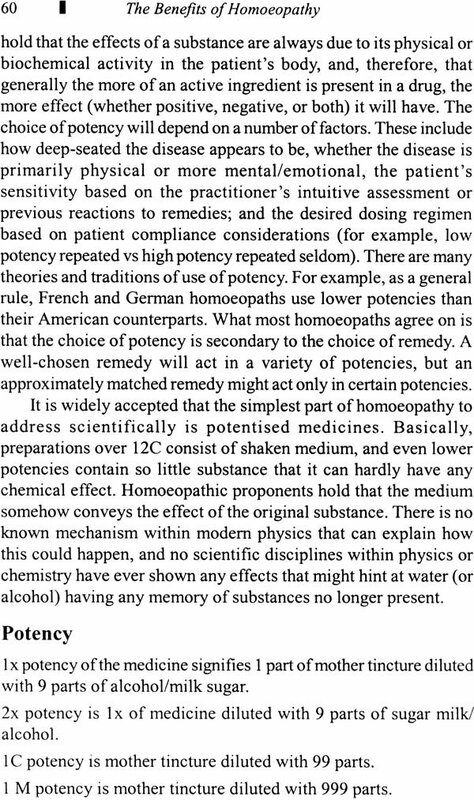 Some commonly asked questions about homoeopathy are also discussed in the book, which will go a long way in clarifying many misconceptions about homoeopathy. Homoeopathy is a holistic and complete scientific system of medicine. It has been in worldwide use for nearly two hundred years. People suffering from all kinds of illnesses, from depression to arthritis, migraine to ulcers, cancers to more modem illnesses like AIDS and myalgic encephalomyelitis, can be helped by homoeopathy to regain their health. Most importantly, since homoeopathy medicines are in dilutions, the side effects are grossly minimised. Hence, this system is perfect in ailments of infants and children. A good remedy removes the disease from its roots and leaves no trace of the disease behind. A person's constitution is given prime importance in homoeopathy because no two individuals are alike. Hence, we have one drug per individual, and this path thus becomes unique and more accurate. Case taking is the most vital part prior to treatment wherein the mental symptoms along with the physical are analysed by the doctors. There is a concept of vital force and miasms which determine the health status and a person's future health condition which are again unique to the principle of this path. Homoeopathy has made tremendous advance, with pioneers such as Dr. Samuel Hahnemann, Dr. James Tyler Kent, Dr. Boeninghausen, Dr. Boericke, and so on, making voluminous contributions and enhancing the spread of this branch the world over. It is recognised internationally as a branch of complementary and alternative medicine. Homoeopathy in India enjoys government support along with the other systems of medicine because government is of the view that the presence of all these complementary alternative systems of therapeutics offers a much wider spectrum of curative medicine than is available in any other country. The information contained in this book is for education, not the practice of medicine. 'Homoeopathy' is derived from the Greek words homoeos (like or similar) and pathos (disease or suffering), which means' likes cure likes'. The efficacy of homoeopathy drugs is well-established in almost all the ailments, including those which are a challenge to the modem medicine, such as rheumatoid, arthritis, cancer, diabetes mellitus, etc. Homoeopathy was discovered by Dr. Samuel Hahnemann, a German physician, in 1790. During one of his experiments he noticed that ingesting the juice of the bark of cinchona, he developed malarial symptoms, like chills, fever, nausea, whereas cinchona drug was actually used to treat malaria. Thus, a new system of medicine evolved, called homoeopathy, based on the principle 'Similia Similibus Curantur', which means' likes cure likes'. That is, a drug that produces a certain set of symptoms in a healthy individual can cure the same in a diseased individual. In his experiments, Dr Hahnemann developed a method of 'potentising' homoeopathic remedies by diluting them in a water alcohol solution, and then vigorously shaking (or succussing) the mixtures. The results convinced him that a high degree of dilution not only minimises the side effects of the remedies but also simultaneously enhances their medicinal powers. Over the past two decades, the use of homoeopathic remedies and visits to homoeopathic practitioners have increased. One possible reason reported is clinical efficacy. Some homoeopathic patients may have personally found previous treatment to be effective or heard from friends, colleagues, and the media, of many cases in which a sickness was healed after homoeopathic treatment. Some reinforce their favourable judgement with selective reference to positive scientific reports. Though they are aware that science has found no adequate explanation for the mechanism of homoeopathy, they may subscribe to an empirical view of the matter. Whatever works in their experience is good enough for them. This attitude arguably characterises most health consumers nowadays, whose main concern is for perceived efficacy rather than scientific sanction for their choice of treatment. This attraction is possibly further amplified from the inability by conventional health care to treat long-term diseases. Another reason could be dissatisfaction with allopathic treatment. Some reject the medical establishment, which is perceived to place too much emphasis on machines and chemicals, and to treat the disease, not the person. Homoeopathic practitioners often spend more time dealing with their patients than conventional practitioners. Furthermore, homoeopathic preparations have few, if any, side effects, and are generally much cheaper than conventional medications. Some are attracted to homoeopathy through its holistic worldview, their desire for their story to be heard out in detail, their belief that their individually diagnosed complaints belong together in one pattern, and so on. There is a holistic as well as individualistic approach to medicine through homoeopathy. This is a key point, and unique to homoeopathy. Even though it may sound strange, homoeopathy does not treat disease per se. A homoeopath does not concentrate his therapy on, say arthritis or bronchitis or cancer. In other words, he does not limit his treatment to painful joints, inflamed bronchi or a malignant growth. Rather, he treats all aspects - mental, emotional and physical- of the person who happens to be suffering from arthritis or bronchitis or cancer. Homoeopathy regards each patient' as a unique individual. For example, six persons with hepatitis might get a different homoeopathic remedy, each one aimed at the individual's totality of symptoms rather than at his liver alone. The physician's interest 'is not only to alleviate the patients' present symptoms but also their long-term well-being. Homoeopathy is based on certain fixed laws and principles that are as true and as unchanged today as the law of gravity. 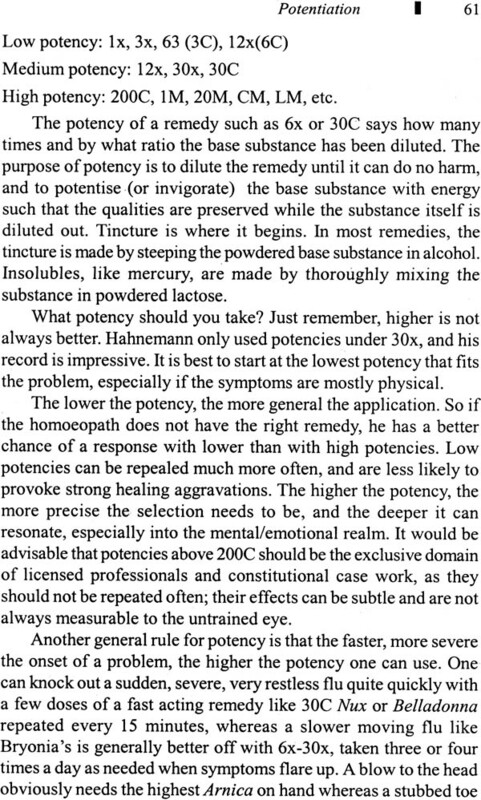 These include the Law of Similars, the minimum dose, the single remedy, the vital force, the chronic miasms, the law of direction of cure, and so on. The science of homoeopathic medicine is based on ascertained facts and abundantly proved deductions. Right from the process of proving of drugs to the prescription of the curative remedy, the methods are controlled by the principles of inductive reasoning. Homoeopathy is the medicine of vital stimulation of mind, which directs all aspects of life in the organism. Disease, as viewed by homoeopathy, is a dynamic expression of the disturbances of the harmony and rhythm of the vital force. The defence mechanism acting on all three levels of the organism (mental, emotional, physical), is the tool of the vital force acting in the context of the disease. Without the vital force the whole body becomes inanimate and sick. Prevention, care and maintenance are best done by behaviour modification, dietary regulation and, where permissible, a regular exercise regimen. Herbal medicines and vitamins may help. The study of homoeopathy is valuable for all those who wish to understand the laws of nature, the principles of healing and the meaning of health and disease of all the branches of medicine. Homoeopathy is most closely related to the laws of nature and human nature.